Mamma Luv is a very sweet girl that will purr when you pet her. She is gentle and loving and is dreaming of a home where she will be the center of attention. Mamma Luv came to Good Mews a few years ago after someone found her and her 2 babies living outside. The person that found them knew that was not a safe for them, so Good Mews was contacted to see if we could help. The babies were quickly adopted and Mamma started adjusting to her new life at the shelter. She was a quiet girl and would never really seek out attention, but she welcomed it when you spent time with her. Mamma Luv was adopted and was in her home for 2 years, when someone became allergic to her. She was also afraid of the 2 dogs in the home, so she was returned. Mamma was sad, but we promised her we would find her a new loving home and this time it will be forever. Mamma is a great girl so if you are looking for a quiet, mellow kitty to join your family, please consider her. 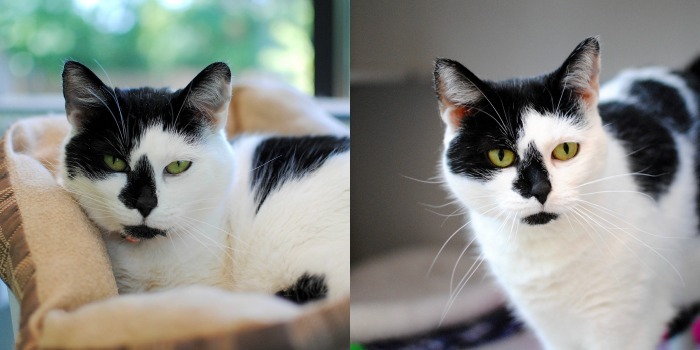 She gets along well with other cats and would probably do best in a home with other mellow kitties.